Chennai: Hundreds of doctors and students from various departments of the Rajiv Gandhi Government General Hospital were seen taking to streets on Monday demanding the release of a senior professor with the orthopaedics department of Madras Medical College, who has been lodged in a Lucknow prison for the past 20 days. Hindu first reported about the case of Dr M Sudheer who had borrowed Rs 20 lakh from a local money lender in Chennai on ‘kanduvatti’ (usurious rate of interest) in the year 2011 to meet the expenses towards his children’s education and for building a house. He gave blank cheques and promissory notes to the money lender. Now, it is reported that the doctor kept on paying the interest as well as the monthly principal payments, but the lender allegedly prepared false documentation claiming the professor had borrowed Rs 40 lakh and demanded that he pay up the amount. A compliant was filed in 2016 by the professor alleging that the lender was threatening him and his family members, with the petition being pending in the Chennai Court. In the meanwhile, Indian Express adds that the moneylender reportedly approached a gang in Uttar Pradesh, which manipulated the blank promissory notes and cheques and filed a police complaint in Lucknow stating that the doctor had obtained Rs 1 crore promising permission for a new medical college. Following the complaint, the UP police obtained a warrant and arrested the doctor on February 24. He has been lodging in a UP jail since then. Hindu adds that Dr. Sudheer’s wife K. Gayathri Devi took up the issue with State Home Secretary Niranjan Mardi, requesting him to take steps to ensure that the due legal procedure is followed and sought the release of her husband. Even,the Tamil Nadu Government Doctors’ Association (TNGDA) has appealed to the State government to take the necessary steps to secure the release of a senior medical professor. “The personal safety of the professor must be ensured as there is a mafia gang behind his arrest,” said the TNGDA, while demanding a fair investigation by an independent agency such as the CBI/CB-CID for ensuring justice to Dr. Sudheer. 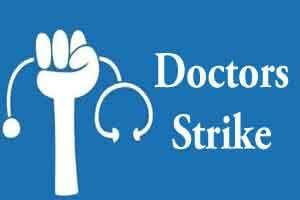 Finally on Monday, students and doctors of the Madras Medical College also took to streets demanding justice for their professor. Dr R Sathish, a PG student from the orthopaedics department, told New Indian Express that the students have made a call to other medical colleges to join them through students representatives.The college administration has taken all steps to secure the release of the doctor, the dean informed. SAPA govt is notorious for imprisoning innocent people.There is a gang of mafia police and politicians working together.Ealier Mulayam used to run kidnapping industry with shivpal the mediator.